Get plethora of job opportunities after completing your Pro E training from NIEDS. We are the number one Pro E Training Institute In Delhi. We have training modules for beginners, intermediates and experts; choose the one that suits your current requirements. It doesn’t matter whether you are a college student or an IT professional, our course can boost your career to new heights. You will learn everything from model tree toolbars and navigators to surface modelling. We expect no prior knowledge, just the desire to learn and some basic understanding of the computer. What You Will Learn In Our Pro E Courses? Sketch modelling tools such as lines, rectangle, circles etc. You won’t find this much quality and value in such a budget-friendly price. Hurry! The seats are filling up fast. 1. Introduction To Pro/E Wildfire.
. Introduction To Pro/E Interface.
. Model Tree Toolbars And Navigators. 2. Creating Sketches In Sketch Mode.
. Drawing A Sketch Using Line ,Rectangle ,Circle ,Arc.
. Dimensioning The Sketched Entities.
. Invoking The Part Mode.
. The Default Datum Planes.
. Extruding And Revolving The Sketch. 4. Understanding The Concept Of Datums.
. Needs For Datums IN Modeling.
. Creating Datum Planes ,Datum Axis ,Datum Points.
. Removing Material By Extruding And Revolving. 5. Options Aiding Construction Of Parts.
. Creating Holes ,Rounds And Chamfers.
. Understanding Ribs And Patterns.
. Creating A Section Of Solid Model.
. Sweep ,Shell And Blend Options.
. Toroidal And Spinal Blend.
. 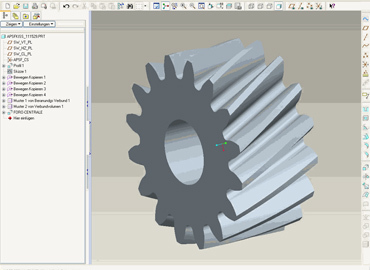 Important Terms Related To Assembly Modeling.
. Creating Top Down And Bottom Up Assembly. 8. Generating, Modifying And Dimensioning The Drawing Views.
. Generating The General Views.
. Editing And Modifying The Drawing Views.
. Adding Notes And Tolerances.
. Sketching In The Drawing Mode.
. Creating A Surface By Extruding.
. Creating A Surface By Revolving.
. Creating Blend And Sweep Surfaces.
. Invoking The Sheetmetal Mode.
. Introduction To Sheetmetal Walls.
. Creating A Flat Wall. The Objective Of NIEDS Is To Provide Quality, Innovative and Reliable Training To The Students / Engineers / Professionals / Entrepreneurs To Bring Their Knowledge / Skill At Par With World's Most Advanced Designing And Manufacturing Areas.